This handy little prayer book fits easily into pocket or purse, and is a great way to remain in God’s presence all day…whether you’re in line at the store, waiting to pick up kids from school, or just stopping for a few moments to reconnect with Jesus! 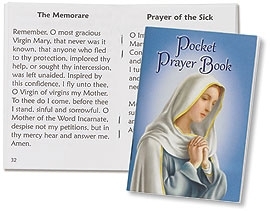 Our Pocket Prayer Book includes Daily Prayers, the Angelus, Act of Contrition, Divine Mercy Chaplet, prayers and mysteries of the Rosary, and much more! It even features Psalm 23, “The Lord is My Shepherd”! This book will help you to obey Jesus’ command to “pray always.” Paperback 64 pages and 2 1/2 x 3 3/8" H.